Download Powerless in Digital HD from the iTunes store. Powerless images are © Warner Bros.. All Rights Reserved. Imagine being ordinary in an extraordinary world. The "muggles" of the Harry Potter realm, if you will. You know you're ordinary and that there are supernatural beings out there doing amazing and terrifying things. Now imagine you want to make a difference in that world. That is the premise of NBC's mid-season half hour comedy, Powerless. Emily Locke (Vanessa Hudgens; High School Musical) is one of those "muggles". She is an ordinary, if bubbly, girl from a little town who has big dreams and aspirations. She takes a job in Charm City to make a difference and while her first day is exciting, it's also very frustrating. Her train gets derailed during a super hero/villain fight, her new boss, Van Wayne (Alan Tudyk; Firefly), Bruce's cousin, only wants to get to Gotham City and doesn't care about their small subdivision of the company and Emily's staff are burnt out and disgruntled, mostly with her. Certainly not the best beginnings. While dealing in the realm of superheroes, Powerless could be just another comedy about working in an office with a motley crew of co-workers. There is the snarky assistant, Jackie (Christina Kirk; Love is Strange), the nerdy tech guy, Teddy (Danny Pudi; Community), and the wacky science guy, Ron (Ron Funches; Undateable). Add in a few non-essential cast members and you have enough jokes to hopefully make a hit show. For the true superhero fan, there are plenty of subtle "nuggets" to keep you entertained along the way, but for the average layperson many of them will surely be missed or misunderstood. The feel of the show itself is also geared towards the nerd in all of us. It has a subtle cheesy undertone that gives it a certain "tongue in cheek" air. It actually reminded me of a children's show my daughter used to watch called Lazy Town (google it). It's purposely meant to be taken lightly but in a goofy sort of way. Hudgens' perky Emily is perfect for the show but reminds me of her High School Musical days. She's always optimistic to the point of being annoying. Tudyk is great as Wayne, though, this is not my favorite of all his roles. Kirk and Pudi have a few funny lines but Funches is the standout among them all. Together, they make a strong ensemble cast and it will be interesting to see how their dynamic evolves over the course of the season. 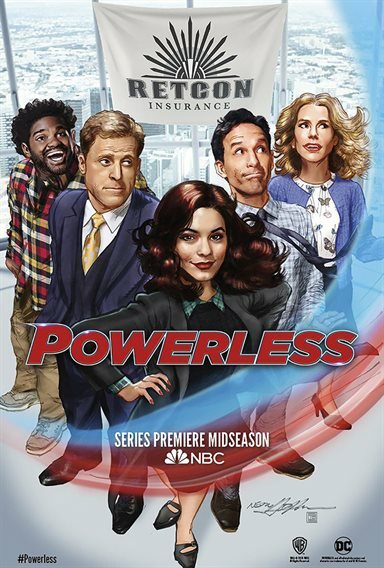 While the concept is interesting and a little different, Powerless definitely has a target audience and I'm not sure it will branch out beyond that realm. We will simply have to wait and see if it can get passed the first few episodes to become a full-fledged hit. I'm not quite sure it had that kind of longevity. 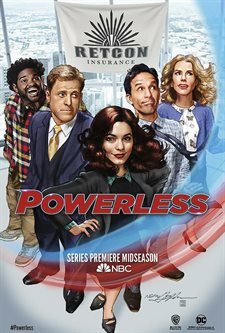 Powerless premieres at 8:30pm on February 2, 2017 on NBC. How Do Superheroes Pay For The Damage They Cause To Normal Citizens? DC's Powerless Has The Answers!